Heating figs up in a bit of honey and butter highlights their sweet flavor. 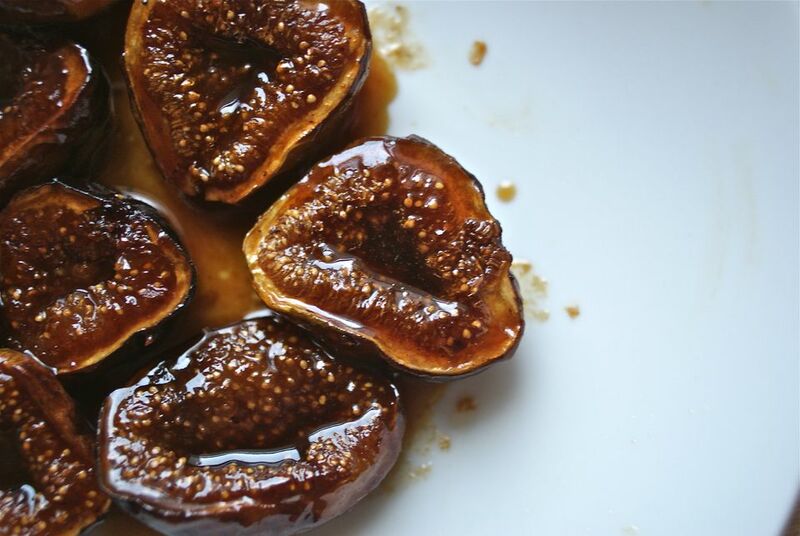 Serving them just that simply is tasty, but you can really kick them up a notch if you use the bits left in the pan after "frying" the figs to make a sauce using port or other fortified wine. if you're feeling extra bold, scroll down to see the flambé option! While these are delicious on their own, they really shine when served as a sort of sauce with ice cream or frozen yogurt. Rinse the figs clean and pat them dry. Trim off and discard any excess stem and cut the figs in half lengthwise. Set them aside. In a medium frying pan, melt the butter over medium heat. Add the honey and gently stir it into the butter. When the mixture is fully combined, set the figs, cut-side-down, in the honey butter mixture and cook, shaking the pan now and again to keep the figs from sticking and spooning the butter-honey over the tops of the figs, until everything is bubbling and the figs are starting to brown, about 5 minutes. If using port, remove the figs from the pan, and whisk in the port (or whatever you're using). Once the wine is whisked in and a smooth sauce forms, let it simmer and bubble for a few minutes to thicken. Add the figs back in the pan, spoon the sauce over them to heat everything together. Serve the figs hot or warm, along with ice cream or topped with a dollop of yogurt or whipped cream, if you like. Don't remove the figs from the pan and instead of using port, use brandy. Take the pan off the heat and pour the brandy over the figs. Return the pan to the heat. If you have a gas stove, simply tip the pan a bit and the brandy should catch the cooking flame. On other stove-tops, use a long match or lighter to set the brandy on fire. Cook, shaking the pan a bit until the fire dies down (it will when the brandy has cooked off). As ever when working with a live flame, exercise extreme caution.